Sweet Itch, otherwise known as ‘Seasonal Recurrent Dermatitis’ is a nasty, self-perpetuating condition affecting horses during the warmer months of spring and summer. Like human hay fever, the condition affects some horses more than others and is exacerbated by itching, which is, unfortunately, the only natural response to the irritation, thus creating a perpetual cycle. In hypersensitive horses, all it takes is one bite from a midge or fly to trigger the cycle of skin trauma, which is why it’s so important to be ahead of the game and protect your horse early on, before midges and flies really become a problem. Prevention, as always, is far easier than cure. - Grazing/wind - midges and flies tend to congregate around water and woodland areas, so keep susceptible horses away. If you can, graze your horses on a windy hillside as flies cannot fly in winds exceeding 5mph. A fan in the stable will help keep air circulating and prevent flies from entering, as will a fly screen. - Grazing/time – flies are most active at dawn and dusk, so avoid grazing your horses between 6pm and 8am. - Rug design – invest in a quality fly rug that will keep flies off the mane and tail as well as the skin. Rugs that extend over the dock and part-way down the tail are great at keeping flies away from problem areas. The head and ears are also vulnerable to biting insects so invest in a rug that also covers the neck, ears and extends part-way down the face. Try to protect the eyes from irritation too. - Choosing a rug – you can find a great many fly rugs at VioVet, as well as fly fringes and veils, hoods and belly pads. Brands include Bucas, Weatherbeeta, Mark Toddand Le Mieux. Many are fully adjustable and machine-washable and, more importantly, will help regulate your horse’s temperature to prevent over-heating in summer. Please contact us if you need advice on choosing a suitable product. - Rug now – ensure the fly rug is worn now and not when the biting insects have already begun their onslaught. By that time it will be too late as the itching will have already begun and the rug will get torn to shreds in the process. 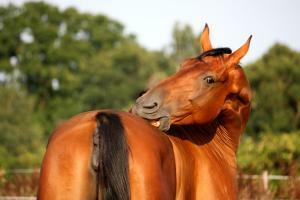 - Supplements – support your horse with a supplement specially formulated for skin and coat health. VioVet stocks a number of these across a range of popular brands and in different formulations. Examples include Dodson & Horrell ‘Itch-Free’ and two from Global Herbs: Skratch Plus and SuperSkratch. The ingredients have been carefully chosen to soothe and repair the skin, as well to repel biting insects. Comment below if you have any further advice on preparing for Sweet Itch season and keeping your horse comfortable and itch-free! I find Switch applied to the mane and top of the tail prevent biting if used early enough in the season. Also I feed the sticky grass that is found in the hedgerow and is a natural anti itch anti inflammatory. These measures plus a fly rug keeps my pony itch free and comfortable throughout the itchy season. Ive started to fully clip my horse early april having done this 2 yrs running it has heloed him enormously.use fly rug as well.